Bump made a few changes to its iPhone app today (the first significant update since its major 2.0 overhaul), including selecting multiple photos to share at once, and pinch-zoom and landscape support in photo viewer. However, it was another feature that really caught our eye: the ability to now send a “location snapshot” to Bump friends. Ok, so, using your phone’s location (which, btw, Bump needs to have anyway to work) the app creates a little map with a pin at the center and sends it as a message to your friend through the “chat” feature (as you see below). The chat feature is basically works the same as sending MMS between you and a friend, but within the Bump app itself, and not like IM (where both users have to be logged in at the same time), with push notifications. So up until now, Bump has integrated well with Twitter, Facebook and LinkedIn, but this new feature would seem to go in a slightly different direction – more towards events and meetups (think OpenTable, Eventbrite and Plancast). This would be a nature progression for the app, as Bump has already added calendar event and calendar comparing functions into the app previously. Another – even more exciting to us – possibility could be perhaps integration with social location services such as Foursquare or perhaps even Latitude. This feature has a very Latitude feel to it in a way, as it is – initially at least – about sharing location with very defined users/people. We also asked Bump if there was anyway to include anything else into this “snapshot” – especially an image, which was our first thought – but unfortunately, that isn’t the case (there is also no way to tag content in the Bump app, which would be nice). 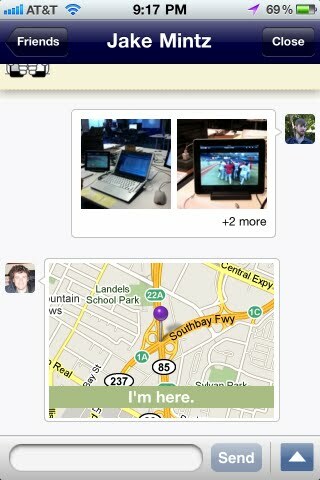 That said, like MMS, users can send images back and forth (Bump made it very clear that these are free to send in the app), so you could say send a friend a location snapshot (i.e. a little map of where you are) and then right after that send an image, but it would seem to us that this would work much smoother if it all came together in one message. At any rate, it will be interesting to see what direction Bump takes this interesting app-internal chat function it is building. As we’ve said before, Bump is one of the most interesting mobile apps out there (heck, you can even Bump an iPhone and Android phone – which btw, Bump says it hopes to have updated “within a few months”) and we’re guessing is a major acquisition target for a number of business-focused companies out there. If its not, well, it should be.